Bread again! I tried making this roll with meat floss, savoury for a change and it was yummy. Dough from the breadmaker after proving and shaping into a ball. Rest for 10 mins. 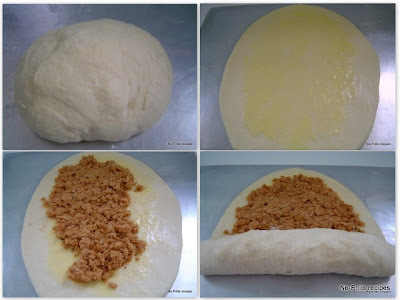 Roll out the dough, apply some butter/margarine on the surface before spreading in the meat floss. Then roll up tightly just like a swiss roll. Tuck in the two ends of the roll and place it in a loaf pan, cover with a damp cloth and let it prove for about 30 to 40 mins. Roll after proving, apply egg glaze followed by sprinkling of almond flakes. Had this for lunch with a cup of hot coffee. A very light and refreshing meal indeed! Sesame seeds/pumpkin seeds and flaked almonds. Put all the ingredients into the pan of the breadmaker according to the sequence of your machine. Press 'dough cycle' and let the machine take over from there. This process will take 1.1/2 hrs. At the end of the cycle, take out the dough, punch out the gas. Shape into a ball, rest for about 10 mins. Roll out into an oblong, spread some butter onto the centre of the dough. Add in the meat floss and press a bit to let it stick onto the butter. Roll up like a swiss roll. Tuck in the ends of the roll and put the roll into a loaf pan. Cover with a damp cloth and let it prove for another 30 mins in a warm place. Apply egg glaze and sprinkle on the sesame seeds. Bake in preheated oven @ 180 deg C for about 25 to 30 mins or till loaf is golden brown. Remove from pan immediately and let it cool completely before slicing up the roll to serve. That is a beautiful loaf of bread! I wouldn't mind eating that for lunch too! beautiful done!! my favorite bread,meat floss!! That's tasty loaf of bread! Great job! well done, i still have some meat floss, so I can bake this bread. Oooo... I'm sure your dearest hubby will love this! yumm...yumm... I love it too! Hope you're having a wonderful day! Looks so pretty rolled up like this! Thanks, Jeannie. I had that for dinner and kept some for breakfast! Kristy, he's got to, no choice! I see! I have fish floss. I can do the same. penny, think it'll work with fish floss too! I will, I will, Anncoo! Home made meat floss will definitely taste much better! Hi, nice of you to have stopped by & thank you! My sister was just telling me about her wanting to make meat floss bread/bun. Your bread looks so fluffy. p/s you do have quite a lot of herbs planted in your pots. yes, they do come in so handy. don't need to run to the store to get them. just pluck from the garden! I've posted another recipe on meat floss buns. Maybe your sis will find it helpful. Eversince I started blogging, I've sort of neglected them a bit, must make up for it!